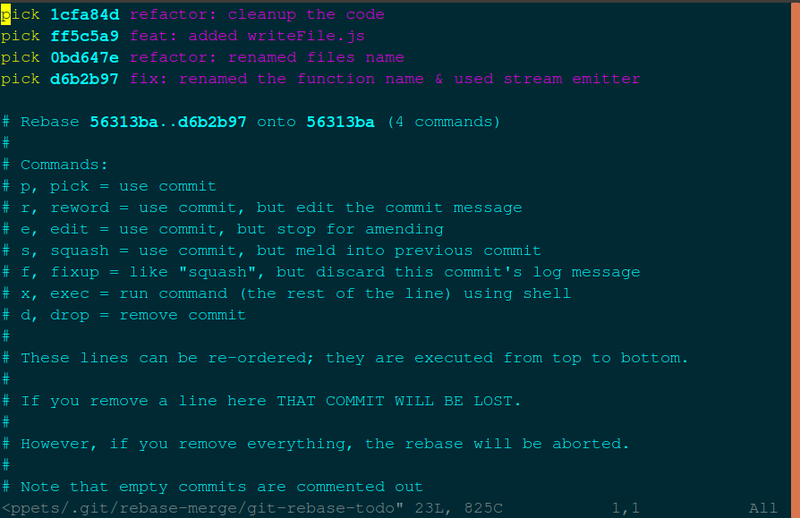 In Git, the rebase command integrates changes from one branch into another. It is an alternative to the better known “merge” command. People ask you to stay away from git rebase but, it can be very useful at times. This articles covers a good use of REBASE command contrary to the definition that is taken from the official git documentation. Let’s talk about a very common scenario which I think all developers may have encountered or will encounter one day. So I did the same, and was also contributing to my personal projects. Let me explain to you how to use this properly otherwise, you might lose your tracking history. Rebase gives you the facility to edit all the commit history but after that, it may overwrite time and date of previous commit message with the current time and date. So in this article, I am going to explain each and every step while using this command. To get all hash ids of commit history. caaf71 is commit id of git history. it should be minimum 4digits. Pick last commit id if you want to rebase whole commit history. After entering the above command you will get below command prompt. 2. Now, edit this file in vim editor by pressing “i” .This will go in edit mode then edit things and replace pick to edit then save it by pressing Esc, “:x” and then Enter. Some useful vim commands are given below. Refer them if you are new to vim. 3. Now you can easily change username or email accordingly by using this command. Here — no-edit plays a very big role if you are using this then it won’t affect other things like commit time. 6. Finally, just push the final changes from the local machine to GitHub. it will update there also your present email and username. Okay, there is a HACK! This is hectic doing REBASE all the time when you have lots of commits very difficult to play with those. Instead of REBASE I would suggest configure your local machine repo initially with two commands, only then start working on that. Guide to recover from accidental commits and rebase in git was originally published in Hacker Noon on Medium, where people are continuing the conversation by highlighting and responding to this story.